Rumi was formed at the beginning of the century and originally supplied cast components to the textile machinery industry. At the outbreak of WW2, Rumi became involved in the manufacture of armaments, miniature submarines and torpedoes. After the end of the war in 1950, Rumi decided to get involved in the manufacture of lightweight motorcycles. It was also decided to base the power plant on the horizontal twin two stroke unit of 125cc capacity. In 1952, with the popularity of scooters, Rumi started manufacturing the Squirrel or Scoiottolo - a pressed steel monocoque body with tubular swinging arm rear suspension and teleforks with 14 inch wheels and three gears. 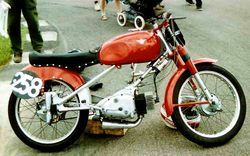 Subsequent models had a four speed gearbox and electric starter and were reputed to be the fastest scooters then in production. In 1952, Rumi was producing the "sports" and "super sport" motorcycle models (single and twin carburetor versions respectively). The "super sport" was superseded by the "Competizione" or "Gobbetto", a pure factory racer. 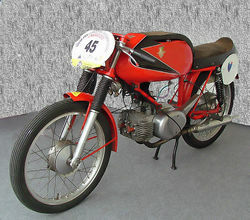 A "Competizione" won the Italian National Championship in 1954. During 1955, the "Competizione" was superseded by the "Junior Corsa" and "Junior Gentleman" . 1954 brought the production of the Formichino or Little Ant scooter, which was reputedly designed by Ing Salvatti. 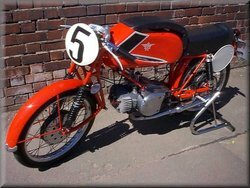 The entire body (with exception of the front forks , crash rails and legshields) was produced in cast aluminium, with the front and rear castings bolted to the engine to form a monocoque which resulted in a light and rigid construction. The rear swinging arm, chaincase and silencer box were also constructed in cast aluminium. These models had originally 8 inch wheels, but by 1958 they reverted to 10 inch which gave a better stability and ground clearance. In 1958, Rumi also produced a sports version called the "Tipo Sport" which had a 22mm carburetor, larger exhaust pipes and a higher compression ratio. In 1957/58 and 1960, Rumi won the famous Bol d'Or 24 hour races at Montlhery in France and subsequently Rumi produced the Bol d'Or scooter named after the race. In the UK, it sported dropped handlebars, chrome plated aluminum cylinders and twin carburetors but the French version favored the Bol d'or with a single 22mm carburetor. 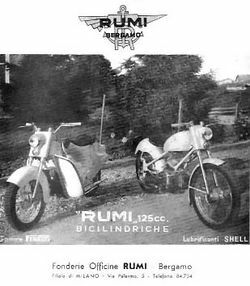 Unfortunately, during the 1960s, Rumi went into liquidation and Donnino Rumi, the archangel of the Rumi motorcycles and scooters went back to his prime love of being a sculptor and artist.